everything from lulu is so so cute! i just can't even go into the store because i want to buy everything in sight! The blue pair is really cute! I can't believe those red ones were so short. The worst is when you see guys running in short shorts! Cute shorts! Maybe if I get some, I will be inspired to work out! I love Lululemon! I still have yet to check out their shorts! I LOVE Lululemon! I used to work for Nike for I have 1 million pairs of runnings shorts, shoes, shirts, etc. I have been banned from buying new workout gear. Like banned for life. Three years later and I still am finding things with tags on them! Ooops. Cute! 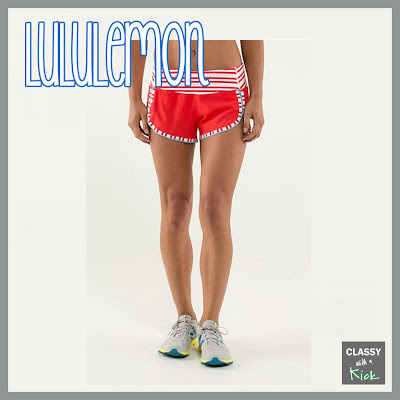 I've never tried Lululemon gear...I've always stuck to basic Nike but I think it's time to branch out! my husband LOVES lulu. i like their stuff but it's so dang expensive! who isn't!? love this post! OMG the red shorts are beyond words!~ Love! I absolutely love Lulu workout wear! They have the best yoga pants! I LOOVE that red pair! oh these are cute <3!